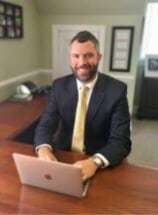 Justin grew up in Harrisonburg, Virginia, and attended Harrisonburg High School before graduating from Covenant College, obtaining his Master’s Degree from St. John’s College, and receiving his Juris Doctorate from the University of Richmond School of Law. Justin spent his summers during law school studying law at Emmanuel College, University of Cambridge, working for the Supreme Court of Virginia, and prosecuting criminal cases in the Hanover County Commonwealth’s Attorney’s Office. Upon graduating from Law School, Justin had the privilege of clerking for Chief Justice Donald W. Lemons of the Virginia Supreme Court, where he received excellent training and preparation in the importance of serving clients in a professional manner through diligent, passionate, detail-oriented, advocacy, with thorough knowledge of the facts and law applicable to a client’s case. It was during his clerkship that Justin became convinced of the vital importance of clients, and particularly criminal defendants, receiving excellent counsel from people who genuinely cared about their future and well-being. Justin returned to Harrisonburg in 2012, where he has since had the privilege of serving both business and individual clients facing a multitude of various legal issues, including a wide range of misdemeanor and felony criminal charges. His practice has grown along with Harrisonburg and James Madison University and he considers it one of the greatest privileges of his life to be able to serve the men and women in the Shenandoah Valley.